I have a comp that will be listening to the keyboard and specifically I'd like to be able to set it up so I can assign each key (or at least many of the keys) a predetermined fixed number that would be output when it was pressed... For example I see that for the keys which happen to actually be numbers in terms of typing it's possible to use a "Receive Keyboard Typing" node and take the Typed Character out into a "Convert Text to Real" node and this allows for having zero through 9 each assigned to a specific key on the keyboard (and that all works), but I want to be able to hit any key and have it output any number I may specify ahead of time (for example how would I make the Q, W, E keys output the numbers 11, 12, and 13)... What would be a good way to do this in Vuo ? 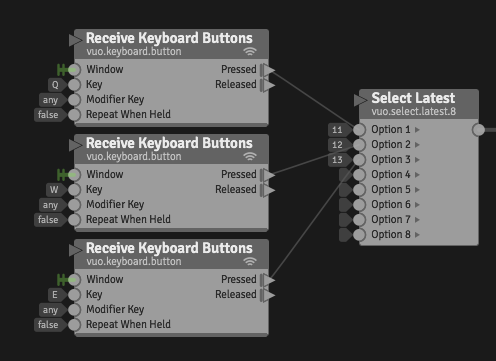 I guess besides the Keyboard Typing node I have the "Receive Keyboard Buttons" node to start with but where would I go with that ? Thanks very much in advance for any suggestions. How do i sample colour from a layer? Choose window with mouse is considered as a click by "Receive Mouse Clicks"
most efficient way of choosing from a list of images?